House the chapel, in the Champsaur Site Des Ecrins National Park. Rent 2 to 4 people in a restored chapel. 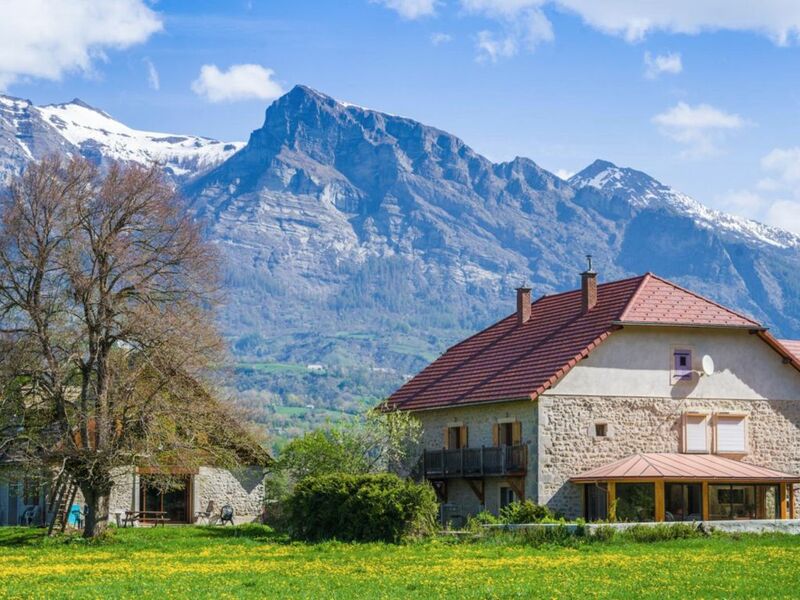 discover our cottage situated in the municipality of chabottes (altitude 1050 m) in the champsaur valley near the entrance to the Ecrins National Park. this apartment is located on the first floor of an old traditional farmhouse champsaur occupied by the owners, the access of the house with a balcony is independent. in a former private chapel vaults, it consists of a bedroom with balcony door, furnished with a double bed 160, a sofa bed of 140 and an office, a kitchen-dining room fully equipped and a bathroom with shower. heating is central. Wood is dominant, everything has been made by local craftsmen using local species (larch, ash, birch, pine) the garden of the house is at your disposal. hiking trails are at the door of this house. 10 minutes, 5 villages stations await you for winter and summer sports. from the balcony there are exceptional views. you love the road bike where mountain biking: We have tours for you, tailored to your level. Like the discovery of nature: I am a specialist in environment and you can ask me all the information on the geology, flora and fauna. you like winter sports: Skiing, cross country skiing, snowshoeing, ski touring we will put you in touch with professionals. You want to make a long mountain trip or have any chance of finding large animals in the Parc des Ecrins we can provide you with a hiking guide. Want to grill, or read a book in the garden, everything is at your disposal. Wellness facing the forest area in a precious wooden pavilion awaits you. He understand jacuzzi and a comfortable lounge. Participation will be required for this service. The bathroom stone tile is vaulted, it is equipped with a spacious shower, a sink and a towel dryer. The kitchen - dining room is birch countries it is fully equipped and custom made. The windows are larch, ash, birch. Ideaal om de omgeving te verkennen. Un hôte très accueillant et de bons conseils ! Une super location. Gîte très agréable. Propriétaire très attentionné, chaleureux. Excellent séjour. gite très agréable et propriétaire très sympa! Nous avons particulierement apprécié l' acceuil amical, chaleureux et trés pédagodique de nos hotes . Ce sont des personnes a la fois disponibles et discrètes. L'appartement bien situé , proche de toutes les commodités et des stations de ski , est d'une propreté et d'une fonctionnalité appréciable. Nous avons beaucoup apprécié votre compréhension du milieu montagnard, la neige , le froid mais aussi la poudreuse et le soleil. Bravo pour votre pouvoir d'adaptation et votre gentillesse. In the middle of the family property, at the exit of the high plain. Food shops are 300 meters. You are 5kms from Saint Léger ski resort, 8 Kilometers of Ancelle and Chaillol and 15 km of Orcières. The Champoléon Valley (National Park gate) is 8 kilometers. If you want to swim Lake St. Julian is 7 kilometers and greenhouse lake ponçon 35 minutes. The top overlooking the valley is the peak of chaillol it peaks at 3168 meters, the climb the trail is 8 kilometers. Golf: Golf is located 9 kilometers is a 18 hole, it is managed by the City of GAP (GAP BAYARD golf ° altitude is 1300 meters.